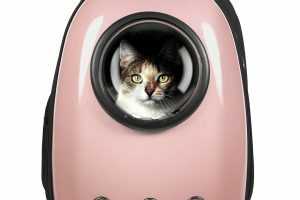 Breeze Litter Box System Review: Does Your Cat Deserve It? Everyone who is a cat owner has had to deal with cat poop and Breeze Litter Box System can be helpful. Whether you are a casual cat owner of one or two cats or a serious cattery owner of a boarding cattery or a breeding cattery, you would have to deal with the dreaded cat litter. 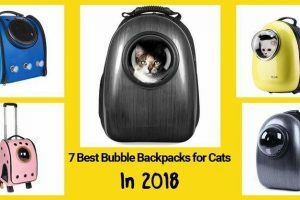 I am not too big with cats, but since my fiancée – a huge cat lover – moved in, I found myself smitten with the little fur balls.It was not an easy love affair between me and the cats. Mainly because of the smell of cat poop and cat urine. I know everybody who is into cats or know someone who owns a cat has had to deal with the distinct and highly nasal offensive cat poop and cat wee-wee. The scratching, hairs everywhere, cats everywhere and their apparent and innate ability to find my keyboard and my lap at my busiest time of the day are easy, cute and quite endearing. The errant poop, the bits of wet spots, the god-awful smell, the sand and clumps of number 2 around the litter box… not quite. Plus, cleaning the litter box, even if it is just once a week is not really a joyful task. Many an argument have come into being because of the simple joy (or lack of it) of cleaning a stinky litter box. Early this year though, an unlikely visit to my accountant’s office would spark what would become a mini-miracle in my cat-loving life. See, my accountant is a fellow cat lover, and he has an office cat. For the unacquainted, the office cat is a house cat that you bring along to your office and stays with you the whole day. His office used to be draped with that ominous smell of a cat poop and cat urine, with the complete aesthetics of errant sand from the litter box, with clumps of cat poo. I cannot stress enough how the Breeze Litter System changed my life. But before I start to sound like a total fanboy, let’s be objective and discuss what I love and do not like about the Breeze Litter System. 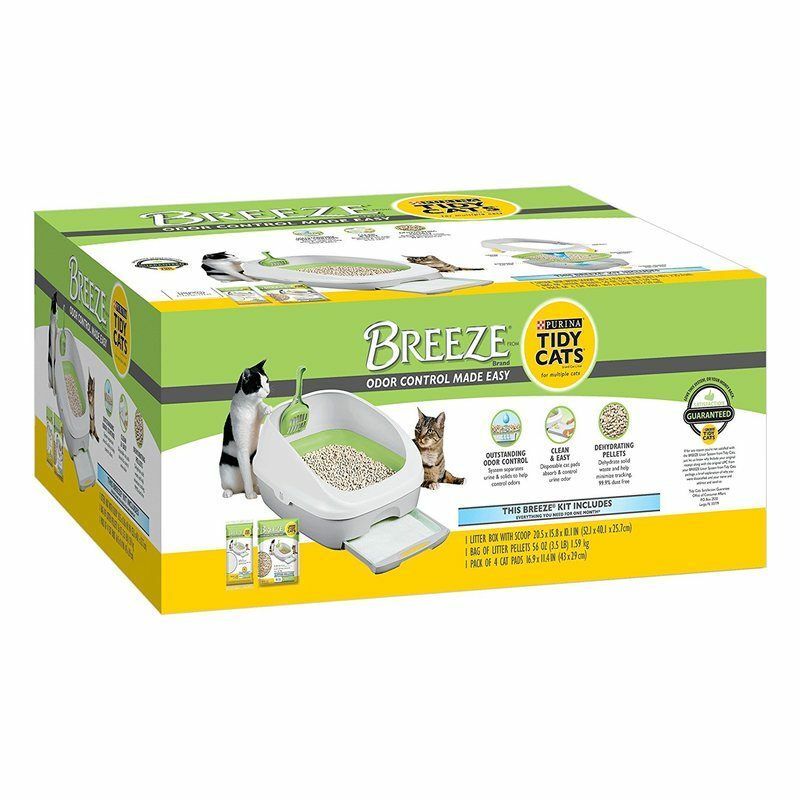 Breeze Litter Box System: What Came With The Pack? 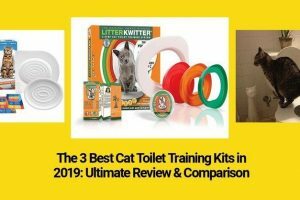 Before we start with the nitty and the dreaded gritty… Let’s look at what you are going to get when you buy the Purina Tidy Cat’s Breeze Cat Litter Box System. When you order Purina Tidy Cat’s Breeze Cat Litter Box System you’d be asked between the hooded system and the open system. 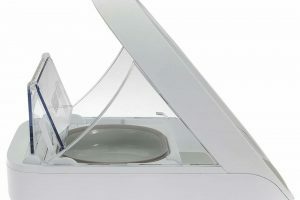 The Hooded Breeze Litter System, simply means that it comes with a cover for the litter box and the open system comes with a walled, rather than an overhead upper. I suggest you get the hooded system because you can easily remove the upper cover without fuzz and the system works the same. At first impressions, the Breeze Litter Box System can seem a bit pricey, but overall you’ll be better off economically in the long run and to be honest, you can’t put a price on peace of mind. One of the most common concerns that I’ve heard from converts into the Breeze Litter System is that the litter pellets can be quite a pocketful, but bear in mind the pellets are non-silica base and they help drive away the smell. Plus, it is way better than those sand and other toxic, cancer-causing options for your cat. And there are a lot of other options out there – pellet-wise – if the price bothers you that much, but on the cost-benefit ratio scale, I would say the 3.5-pound sack of litter pellets that come with the Breeze Litter System is more than enough to compensate. The pellets are dust-free and anti-tracking so you would not have to mind all those errant, poop-covered sand getting everywhere. 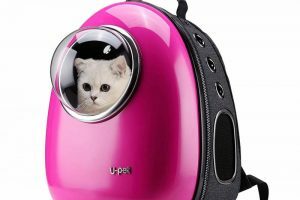 It allows cat urine to easily pass through and at the same time, clumps with cat poop at the top for a quick and easy removal with the plastic litter scoop that comes along with the Breeze Litter System. The label says to use the pad once a week, but you can easily go for two weeks depending on your cat’s diet and waste removing schedule. We have a couple of cats and sometimes, I have let a pad last more than a day or two (once even an extra week) and it did not affect the smell of the room at all. Ok, now that we got the pleasantries out of the way, let’s focus on our experiences with the Breeze Litter System so far. We have been using it for more than a couple of months now, our cats love it and the transition was way too easy. It is a true self-cleaning system, unlike the automated poop, urine, and pellet that we had been using a while back. It uses gravity and physics, an ingenious pad and pellet system and nothing more. The Breeze Litter System is very easy to use and very easy to assemble. This is no Ikea product that much I can tell you. Plus, it is also very easy to customize. You can search on Youtube and you can find people who have personalized their pellet, drain, scoop, filter, pad usage to fit their needs. At this point, you can probably tell that I am very particular about the smell of cat urine and cat poop. And this quite probably sold me in on the Purina Tidy Cat’s Breeze Cat Litter Box System. The awful cat poop and cat urine smell just weren’t there with this particular system. I didn’t even know that was possible? I was resigned to the thought that if you want to have cats you got to deal with the smell. I was just looking for a less messy and not to mention “healthy” or sanitary option for my cats. All the people that I have talked to who use the Breeze Litter System seem to have the same experience with me when it comes to transitioning over to the new litter system. Everybody says it is crazy easy. Surprisingly, the only issue that I have heard with fellow cat owners who use this system is how some cats do not like the hood or the covering. But that is very easy to address if you have a picky cat that does not like the covers, just remove it. Same goes for the wall when it comes to the open system. 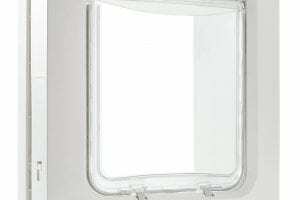 You will have to option to remove the white plastic covers or retain it depending on your cat’s preference. Simple cat litter box hack: Don’t force your cat to transition over to the Breeze Litter System from your old litter box. Just place the two litter systems besides each other, then stop cleaning the old one for a couple of days. Cats are very picky and particular to their pooping and peeing sanitation and will transition over to the new litter box on their own when they find that that is cleaner and more hygienic. I have discussed this above. At the get-go, the Breeze Litter Box System pellets would seem expensive, but if you factor in the idea that it is 99.99% dust free, allows urine to simply pass through to your pads for easy odor elimination and control, and it dehydrates cat poop for easy scooping and to prevent cat tracking then you would find that the cost to benefit ratio is nothing but pure genius. And like I said if the extra dollar bothers you that much, you have other pellet options out in the market. I just chose to stay with the Purina Tidy Cats Breeze Litter System Cat Pellet Refills’ because I think they are non-toxic to my cats, they are effective and they are not silica based which can cause cancer for cats like other clumping litters out in the market today. 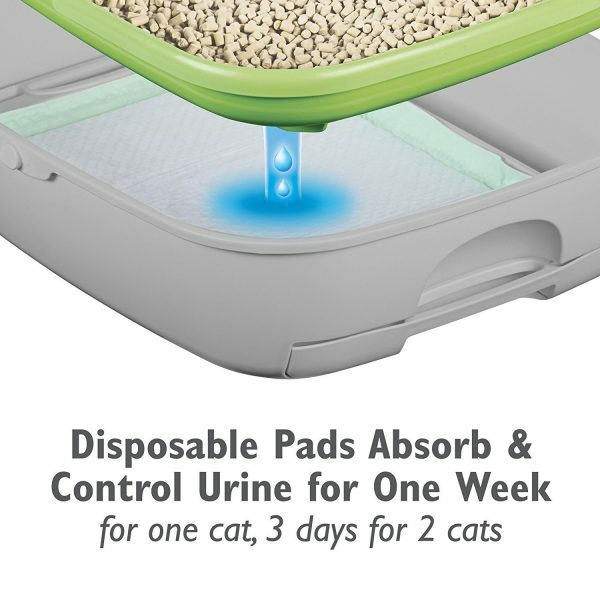 Urine pads for cat litter systems are nothing new, I know… But the Breeze Litter System Urine pads are nothing short of amazing. I feel like a parent who just recently found the best pair of diapers that is suitable for my children. We have multiple cats taking multiple pees on the Breeze Litter System and the pad holds up to the challenge without a problem. Plus they have amazing odor control capabilities, this really was a real game changer for me. The drawer for the urine pads seems fancy (to me at least) and the pullout drawer for housing it in the Breeze Litter System is a great and easy way of putting in and removing the urine pad without disturbing the Breeze Litter System that you’ve already set up. I have to admit, when I first opened the box I thought the Breeze Litter System was a bit bulky. When I put it together, I was quite taken by how new age and great it looked. It definitely is a conversation piece especially for cat lovers and cat enthusiasts. The Breeze Litter Box System is idiot proof like I already said. 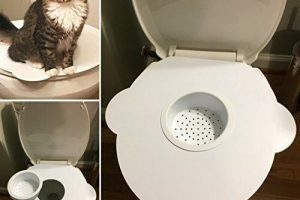 It is very easy to put together, very easy to use and surprisingly even my cats had no problem with the transition from their old litter box. The way the pellets dries out poop filters urine and how it all falls into the urine pad after makes life easier. You can just pull out the drawer for the filter pad, take the corners and fold the urine pad into itself and throw it away. The poop is easy to scoop with the filter when it is already dried and dehydrated. Again, it is idiot proof. I dare you to look at the Youtube reviews and other users experience with the Breeze Litter System and you’d find that even the most skeptic of skeptics out there who have looked at and used the system are easy converts. In summary, Purina Tidy Cat’s Breeze Litter Box System is heaven sent. 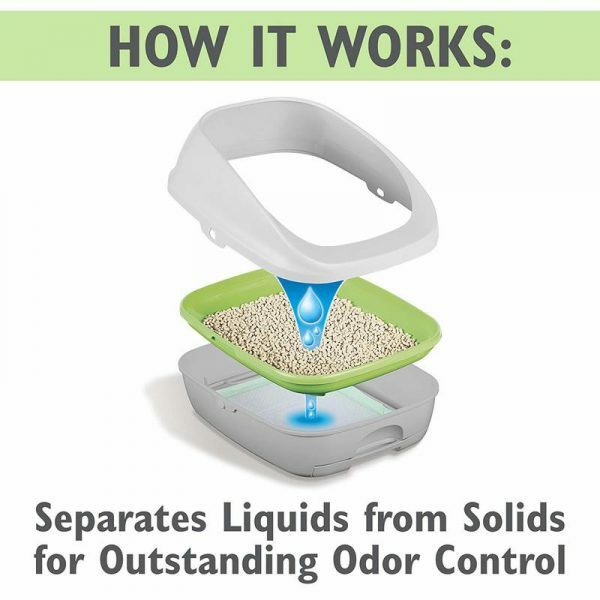 I mean it is easy to use, nice to look at, the cats love it, I love it, the smell is gone, and the litter box is clean. What more can I ask for? Treat your cat and yourself, to a great time. The bang in this particular case is well worth the buck.